Periodontal disease is an advanced form of gum disease. In its early stages, this condition is called gingivitis and is evidenced by red, swollen gums that bleed easily. When gingivitis is not treated, it can lead to periodontal disease, where the gums recede away from the tooth. There are many different treatment options, some of which are referenced below. As the leading cause of tooth loss in adults, periodontal disease must be taken seriously. In this advanced stage of gum disease, the gum tissues are no longer attached firmly to your teeth. Instead, they have pulled away from the root and formed pockets. The recession of these tissues will ultimately cause your teeth to become loose. From there, they may have to be removed. Patients can halt the progress of gum disease by adopting good oral hygiene habits, such as brushing and flossing regularly. Dental cleanings are also important for prevention. 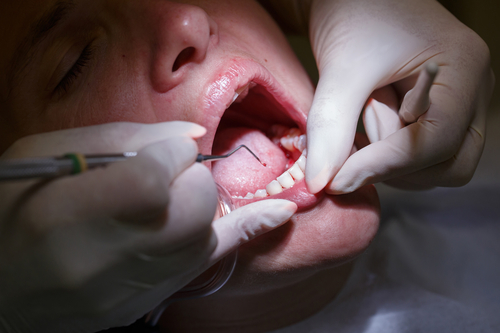 The advanced stage of gum disease after gingivitis requires treatment. Your family dentist may recommend scaling and root planing, during which plaque and calculus are removed from underneath the gums. This procedure is done under local anesthesia. If the gum tissues have formed deep pockets that are difficult to keep clean, your dentist may suggest pocket reduction or flap surgery. During this procedure, infectious bacteria are removed and the bone is smoothed out, which allows the gum tissue to reattach. Since gum tissue doesn’t grow back, severely receded gums can only be attached through surgical means. For example, bone and tissue grafting uses donor tissue from the roof of your mouth to restore your gumline. Periodontal disease must be treated to prevent the loss of your teeth, but it can be done with minimally invasive methods. The dentists at High Point Smile Dentistry are certified in the Chao Pinhole® Surgical Technique. This cutting-edge treatment for gum disease expands and adjusts the existing gumline to cover the exposed root structure of your teeth. Visit the website for more information about gingivitis, periodontal disease, and this approach. Call the office in North Carolina at (336) 884-4000.